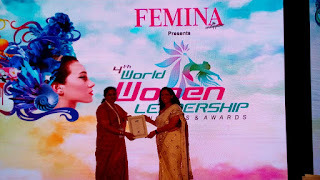 Tharuni Founder Dr. Mamatha Raghuveer Achanta received World CSR Congress Women Leadership Award on 17-02-2017 at Mumbai. The World Congress for corporate responsibility was held in Taj Lands End Hotel, where in, hundred companies Representatives ,NGOs Foreign Company representatives attended, to discuss on global issues of economy.There were Stalls by different Companies to exhibit their products. Tharuni was chosen as NGO working for the progress of Girl children and women, for nearly two decades. Tharuni Founder Dr. Mamatha received the Merit Certificate under Women Leadership Award. Tharuni organised an Interaction Programme with identified existing NGOs& CSOs in Warangal Rural & Urban Districts of Telangana for formation of Girls Advocacy Alliance Net work, to promote equal rights and opportunities for girls and women,supported by Terres des hommes Netherlands, on 8th February 2017 at Waddepalli Community Hall, Hanamkonda. The main objectives of this interface meeting is to bring all NGOs to one platform ,in order to empower the Girl Children and young women. It also enables to raise the voice collectively on violation of rights and opportunities against them. Further it leads to exchange field experiences, ideas and knowledge, information and find solutions by giving suggestions. Different NGOs like MARI, Pragathi, Dharani,Sarvodaya, Spandana, Mallikamba Manovikaskendra,Jana Sikshana Sanstha, Child Line, Priyadarsini Mahila Mandali and others,participated. Dr. Mamatha Raghuveer, Director of GAA Project, explained the role of networking of all NGOs in the District to serve the Young women.She also said that Status Cards will be issued to track the status of Girl Children.The champions who served the Girl child in distress from NGO &;CSOs will be felicitated during this year.All the NGOs expressed their interest and solidarity to unite and work for the welfare of girl child. There is going to be another Meeting in the last week of February with a plan of action.